I have been busy re organizing in my studio lately, but paused a while to continue working on this mixed media canvas I had started. It is a fun piece that I wanted to use the digital stamp image: "Cupcake Curls", from Get Inky! for Blue Moon Creation. I download the cupcake and printed it onto regular copy paper three times and cut out the different components. I transferred one image directly to the canvas and then I proceeded to adding the layers of collaged old book pages from a vintage Betty Crocker Children's Party cookbook. I also added some pieces of torn cupcake liners. With gelatos and glimmer mists and paints I worked up the background. I cut out a red cupcake base from some scrap thick scrapbooking paper that I ran through a paper crimper to give it that cupcake liner look. 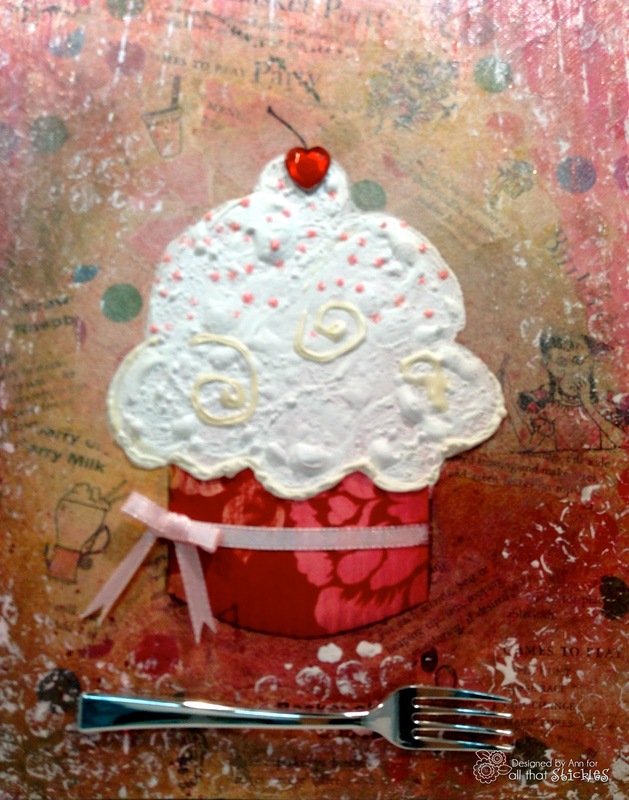 The frosting I made with white paint, gesso a heat gun and then white puffy paint and more heat gun. I added Cotton Candy coloured Stickles by Ranger as sprinkles. The cherry on top is a faux ruby heart gem. The ribbon around the base is from my stash. The fork at the bottom is a party remnant.